Everyone likes being independent. It’s our freedom that make us feel alive and have options. The best electric wheelchair allows anyone to be able to easily control where they want to go. Unlike standard manual wheelchairs that need to be pushed by someone else, anyone can easily navigate this device, turn corners and make U-turns with little effort. The mobility offered by these devices really helps anyone have full control of what they want to do when they want to be able to do it. Best Electric Wheelchair: This is a lightweight, foldable wheelchair that is very easy to steer. We like it for its mobility and comfortable ride. Most of all, we like that it makes really smooth turns and tight u-turns. Its overall size makes it our top pick in our electric wheelchair reviews as it lets you move around the home and hallways conveniently as well as make transporting it simple. Weighing 50 lbs., the unit has folding foot pads, arm rests and back rest. These make it pack down so you can fold the entire unit down like an accordion. When in the folded position, it resembles a baby stroller, that can easily be places in the trunk of your SUV or car. Using a rear wheel design, the unit moves faster than many front wheel drive wheelchairs. It also allows for a turn radius of only 31.5”, making it easy to maneuver when at home. For dealing with sidewalks, it is capable of going up 12 degree inclines. For power, you will need to recharge it as the battery will run out after a while. On average, a full charges lets you go around 9.3 miles before needing a charge. The good news is, it takes only 5 hours to get it from empty to fully charged. 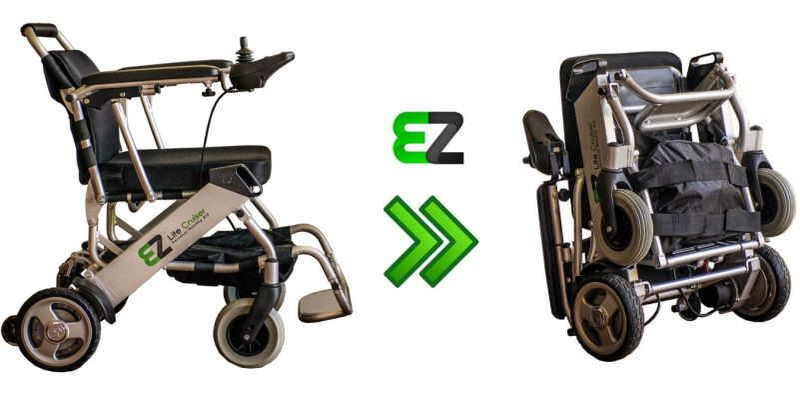 Another very compact unit that offers you the ability to fold it for transport, the EZ Lite Cruiser is another good option. The unit supports users of up to 264 lbs. and lets you travel over 10 miles on a full charge of its lithium ion battery. The unit uses a similar joystick control for mobility. Weighing the same 50 lbs. 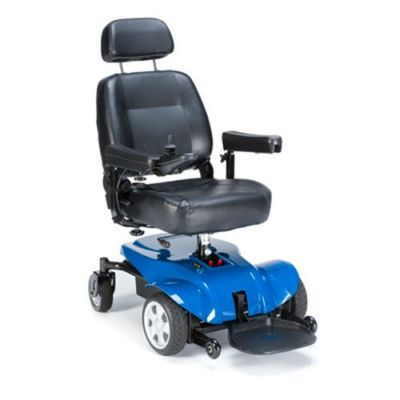 are the Smart Chair above, the EZ Lite Cruiser has a slightly smaller turn radius of 29.5 inches. This lets you get around corners as well as make u-turns in tighter areas. Built to let you get through flat surfaces as well are rougher terrain, this electric wheelchair goes through humps, grassy areas, cement or wood pathways without any problems. It also offers you a smooth ride throughout. Moving between the wheelchair and sofas or other seats is also easy as you just need to pull up the arm rest, fold up the foot rests and slide out of the device into another seat. Very easy to control, and offering a smooth ride, this power wheelchair folds differently from the Smart Chair. To do so, you fold the backrest and them push the seat down to compress the device. This leaves you with a small package that you can put in your car’s trunk. Best Electric Wheelchair for the Money: If you’re looking for a more affordable unit, this is one of the items to consider. It costs less than those reviewed above and offers a comfortable, smooth ride as well. One thing you’ll want to note is that the Invacare Pronto P31 uses a front wheel drive mechanism. This compared to the rear drive systems used by both the Smart Chair and the EZ Lite Cruiser. This gives it a different feel both when starting as the movement comes from the front rather than the back. Also because the mechanism is in front, the P31 turns using the front section whereas the other 2 devices above use the rear wheels to initiate the turns. As a result this uses a smaller turn radius of only 26.5”. Not foldable: the Pronto P31 does not fold down like the 2 previous. This means it isn’t as easy to fit into your vehicle. More seat cushioning: however, one of the advantages is that it offers a more padded, comfortable seat and backrest. Plus there is a comfy head rest as well. Still very compact: while not as slim in build nor foldable, this unit is still relatively compact. It measures 38.75 inches long and 23.5 inches wide. Longer range traveled: on a per charge basis, you get to go as far as 13 miles before needing another charge. Heavier: as you’d expect, the denser padded seat and bigger frame means it weighs more. Including the battery, the P31 weighs 153 lbs. Higher user weight capacity: another advantage of a heavier, bigger framed wheelchair, it supports up to 300 lbs. which is around 30 to 40 lbs. more than the other 2 above. 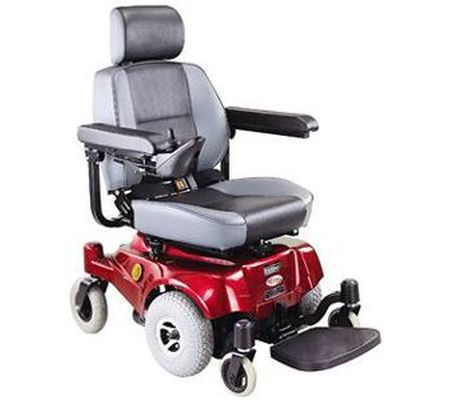 Similar to the Invacare Pronto P31, this is another comfortable seated power wheelchair. The unit is set up on 6 wheels with the main on set in the front/middle. The additional small wheels in front assist in making turns efficient. It is equipped with solid 10” wheels that, along with the motor, allow the power chair to travel as fast as 4 miles per hour. Designed with comfort in mind, it offers a wide 19” seat width, thick cushioning on the seat and back as well as an extended foot plate that can be adjusted to 3 different angles. Among our picks it has the furthest travel range at 14.4 miles. It also includes a seat belt for extra safety. 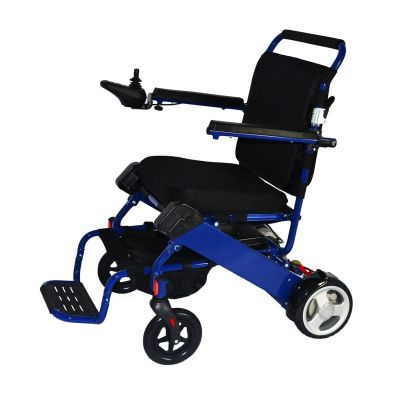 The power chair’s frame along with its 4,600 RPM motor supports users of up to 300 lbs. and can go up 8 degree inclines. It also has the smallest turning radius among our best electric wheelchair picks at only 22.4”. Continuing on comfort, it also has adjustable arm rests. You can move them up and down and extend them out as well. While longer in size and heavier in weight than the others we’ve reviewed so far, the comfort features of this power chair makes it among our top picks. For those who’d like to be able to express themselves through their wheelchairs, this FOLD-N-GO offering comes in a variety of colors. There are 6 colors in all including traditional ones like black and silver. Other colors include yellow, hot pink, red and blue. 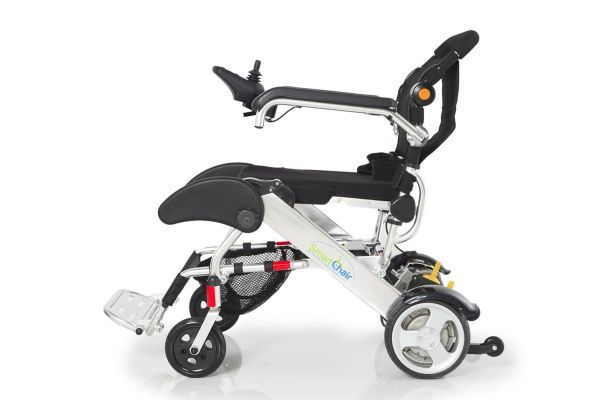 This is the lightest among our electric wheelchair reviews at only 46 lbs. It offers pretty much the same speed limit of 4 mph as the others and lets you go as far as 12 miles in distance on a charge. This is another folding wheelchair that makes it easy to fit into compact areas as well as vehicles. Its 8” wheels, motor and chassis give it some shock absorption features so you don’t feel tons of bumps while going through not so flat surfaces. These also let you go up 12 degree slopes. Measuring just 34 inches long, 24 inches wide and 36 inches high when fully set up for use, it folds down to 10 inches high for compact carry. They may be more costly than the regular wheelchairs, but electric wheelchairs are worth the extra cost because it makes getting around easy. You can control everything from speed to direction.